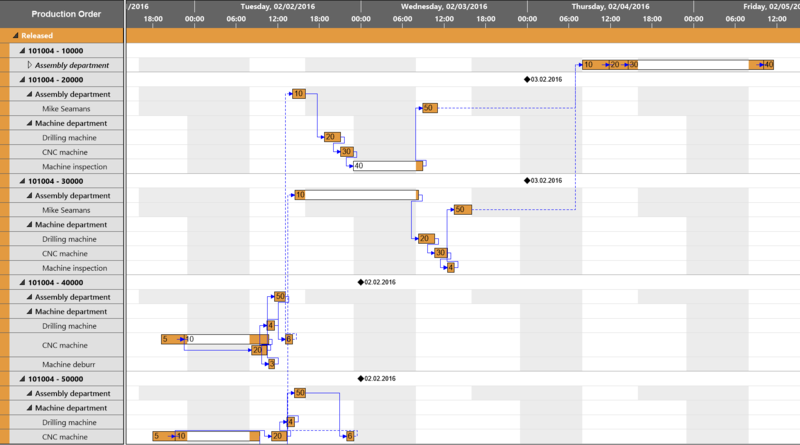 The Visual Production Scheduler (VPS) is an interactive graphic planning board for Microsoft Dynamics NAV, visualizing production orders, production order lines and operations in connection with the capacity utilization of work and machine centers. Operations can easily be moved by drag & drop, thus not only providing new transparency of the Dynamics NAV data, but also enhancing the Microsoft Dynamics NAV production scheduling capabilities. A new version of the VPS also for Dynamics NAV 2016 will be available on November 23, 2015. Amongst other new features, a major enhancement is the multi-level visualization and visual scheduling of linked production order lines as they typically are used in an make-to-order environment. A new linking lets the planner recognize whether the completion of the single suborders are scheduled in a way to not jeopardize the delivery date of the entire order. In a make-to-order environment, users of Dynamics NAV have the opportunity, to create a parent production order with all the dependent child production orders as multiple production order lines of the parent order. In essence, this is achieved by labelling both the production order and the respective bills-of-material of the "child products" as make-to-order. In the VPS, the dependencies of the single operations of the production order line are visualized by links when the orders are definded as “make to stock”. Version 1.4 now also provides visualization of links of the different production order lines within one production order when the item is defined as “make to order”. This allows the planner to control whether completing production order lines within a lower level would jeopardize the completion date of the entire order. For this, the setup dialog of the VPS offers the option "Show links between Prod. Order Lines" in the "General" area. By that there will be additional dashed links between dependent Production Order Lines. The dependencies between these multi level Production Order Lines, visualized by the previous mentioned links, can be included in the process of automatic scheduling. This feature can also be activated in the setup dialog by ticking "Schedule acress Prod.Order Lines" in the "Scheduling" area. For the purpose of providing still more customer-relevant information in the planning table, the Setup dialog was enhanced by two new options: “Configure Tooltip” and “Configure Label”. In both cases a dialog allows to specify the text to be shown in the tooltip or as bar label by selecting the desired NAV data from a list, either by adding or removing them. Want to see the Visual Production Scheduler for Microsoft Dynamics NAV in action? Please schedule a demo and we will be glad having the opportunity to share the enhanced Microsoft Dynamics NAV production scheduling capabilities with you.